General Dentistry Tinley Park IL | Treatment that includes root canals, botox! 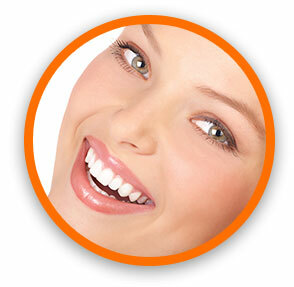 The foundation of a healthy smile is the commitment to general dental care. Your six-month visits keep your teeth clean and help prevent future problems by letting us spot them early. We can address your unique situation and develop a relationship that maintains continuity of care. Click on the headings below to learn more about some of the ways we work with patients to maintain proper oral health. A major reason to visit the dentist is to have your teeth cleaned by a professional hygienist. Plaque and tartar develop on teeth over time. Plaque is soft and sticky, but daily brushing can usually remove most of it. However, when plaque hardens into tartar, it is beyond the scope of a typical toothbrush and floss. Tartar accumulates beneath the gumline as well as on the tooth surface. If you don’t remove plaque, you risk more serious problems with your teeth and gums down the road. Recent research shows a correlation between untreated gum disease and other serious conditions like heart disease, stroke, and diabetes. Having a regular teeth cleaning is one of the best things you can do to stay healthy! Teeth with damaged or infected roots used to require extraction, which can create a lot of problems and should be avoided if possible. The good news is that we are highly experienced in advanced root canal therapy. A root canal is a technique to repair a tooth by removing the pulp chamber and replacing it with a filling material. This is often needed when dental decay reaches the nerve of the tooth (or the tooth is infected), and a standard filling will not be suitable. In the not-too-distant past, the situation described above would have required the tooth to be extracted. When dentists began performing root canals, they were quite dreaded, and the root canal has gotten a reputation as something to be avoided. However, using modern anesthetics and technology, root canals are generally manageable. Is it possible to visit the dentist and never feel the drill or pinch of that dreaded needle? One of the most amazing advances in recent dentistry is called air abrasion. 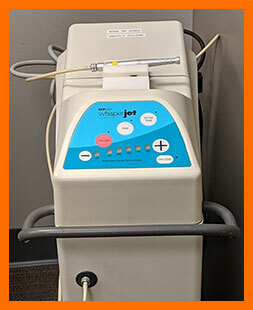 Instead of a conventional drill, this device aims a stream of tiny particles and air at tooth decay and gently mists it away. Many patients need little or no anesthesia at all. The sound and vibrations of the drill are gone – and most of the pain. For some procedures, you can say good-bye needles, good-bye drill! Just as our bodies evolve as we age, our teeth and gums do too. Decades of plaque buildup, as well as consuming coffee, tea, or tobacco, can darken teeth. Ask us about procedures to combat these problems. Reduced flow of saliva is sometimes a side effect from medications. There are basic products that can help these conditions. Your fillings are also getting older. They might weaken or crack. Regular check-ups will allow us to maintain your existing fillings. 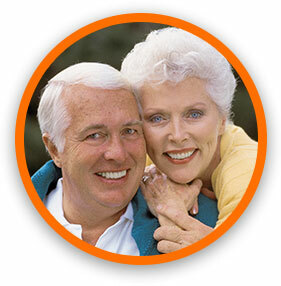 Gum disease and root decay can be serious problems with seniors. Daily cleaning and good nutrition are important for healthy gums. If your gums become red or bleed or your teeth start to feel loose, please contact us immediately. You might not know that oral cancer causes one American death every hour. For 40 years, this mortality rate has stayed the same. But it’s not all bad news. Early detection means a 90% cure rate for oral cancer. That’s why we conduct a visual screening for oral cancer at every six-month checkup and cleaning. If the hygienist or doctor sees anything suspicious, they’ll refer you to an oral surgeon. This screening could literally be lifesaving. Oral health can have a bigger effect on a person’s life than regular cleanings and the occasional filling can address. Many patients who’ve dealt with injury, illness, bite issues, and simple wear and tear can have chronic problems that they aren’t even aware began in the mouth. Bruxism (tooth grinding), TMJ, periodontitis, crooked or misshapen teeth, and missing teeth can combine to cause headaches or migraines, toothaches, chronic bad breath, and an unattractive appearance. But you no longer have to live like that. Our doctors will sit down with you to discuss your specific situation, symptoms, and goals. After reviewing digital X-rays, photos, and imprints of your smile, we will present options for a treatment plan to address your issues and achieve a healthy, pain-free, beautiful smile. We can also discuss phased treatment and financial planning to help put your dream smile within reach. Making Your Best Smile Look Even Better! A beautiful smile is a wonderful thing to give yourself. But imagine how your new smile could look even better by removing facial wrinkles and age lines. 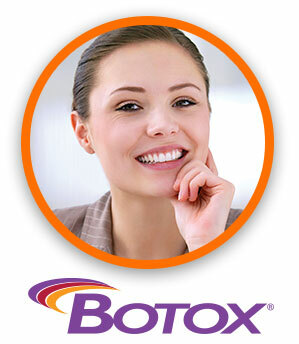 In as little as one visit, we can temporarily erase lines and wrinkles from around the mouth and erase those pesky crow’s feet and stress lines on your forehead using BOTOX™ Cosmetic. Because BOTOX works by relaxing muscles, it can also be used to treat TMJ-related pain in the jaw, head, and neck and even ease migraines. Ask us about this treatment today! If it’s time for your next cleaning, or if you’re ready to schedule a no-cost/no-obligation consultation, call us now at (708) 532-4131.